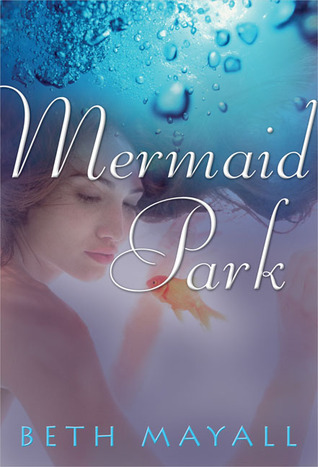 Mermaid Park by Beth Mayall. Razorbill, 2005. Currently Available. Face Value: So dreamy. The underwater image has an ethereal quality. I’m not sure what’s going on with the kissy face she’s making at the goldfish, because that is definitely not in the story. I am also uncomfortable with the way the cover model’s arms just seem to fade away somewhere – there are no discernable limbs keeping her afloat. Does it break the slate? Well, no. Amy, Mel, and her mother are struggling to define themselves as independent women. Amy especially tends to be reactionary. When someone provokes her, she immediately becomes defensive and closed off. Throughout the book she develops more positive, assertive tendencies, though she still has a long way to go. Who would we give it to? Swimmers will love this book. It is packed with descriptions of shooting through the water, the scent of chlorine, and the feeling of pushing through current. Unfortunately, I am not a swimmer (I hate the feeling of being immersed) so I know I did not fully appreciate the descriptive nature of the book. Review: This is a summer job story born out of desperation. Amy so despises spending time with her stepfather that she begs and pleads to stay behind on their family vacation. She, her sister, her mother and her verbally abusive stepfather have travelled to Wildwood, New Jersey to visit a family friend named Lynne. Lynne owns a hotel in Wildwood. Amy’s only respite from the family tension is the pool. As a competitive swimmer, Amy lives for the water. Continuous laps help her clear her mind of the anger that accumulates from the interactions with her stepfather. As Amy’s family relaxes on the boardwalk, she escapes by wandering deeper into Wildwood. Amy discovers a rundown mermaid aquatic park, featuring daily shows with mermaid girls doing choreographed swimming. Amy is entranced. She loves watching the graceful swimming of the mermaids. When it’s time for her family to leave, Amy cannot bring herself to go along. She manages to arrange things so that she can live with Lynne for the rest of the summer, and she becomes determined to get a job at Mermaid Park. Amy’s summer job search is different than the others we’ve described this week because it comes from desperation (she needs the money) and an intense longing to swim gracefully like the mermaids in the show. She hangs around the park helping out voluntarily until they hire her as a maintenance person. Amy continues to make an impression at the park, because she arrives early and stays late. Her work ethic is admirable, but it comes from a darker place. Amy is so desperate to swim in those tanks that she clings to the park and becomes unhealthily obsessed with her job. Her focus on Mermaid Park becomes so great that she neglects personal relationships. Although Amy’s definitely a dedicated employee, it is not the best example of how one should go about working a summer job. Eventually Amy grows stronger as a swimmer and as a young woman. She gains confidence and learns how to better manage the tension in her family. More importantly, she does learn to take a deep breath and control her own anger. At the end of the summer, Amy still goes home to live with her stepfather, but she does so better prepared to deal with the challenges that entails. It’s not exactly a Slatebreaking ending, but Amy is headed in the right direction. This book is beautifully written, and it conveys a sense of summer lethargy and melancholy that is difficult to describe. I love how Mayall has captured the highs and lows of summer, from the quick heartbeats that note the beginning of a summer romance to the intense longing for the summer to keep going even when it is coming to an end. For those who want to be in the pool but are somehow trapped inside, this book would be a perfect summer companion. Reviewed from a library copy. This entry was posted in Reviews, Theme Week, Young Adult and tagged beach, mermaids, New Jersey, summer jobs, swimming, theme parks. Bookmark the permalink.